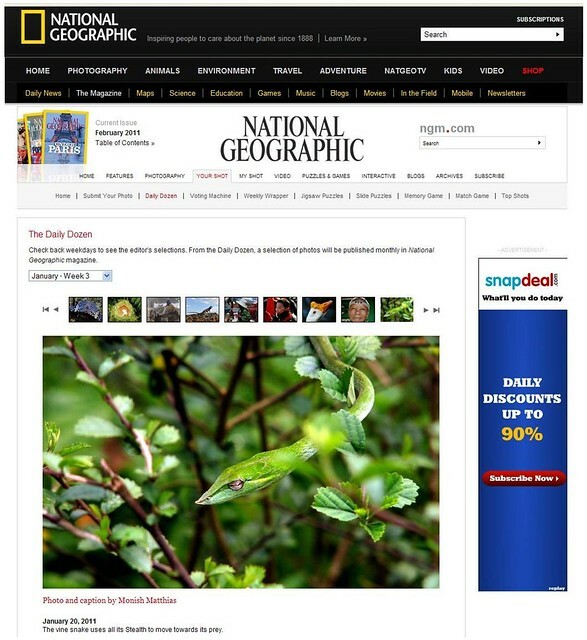 What Exactly is the Nat Geo's - The Daily Dozen? The explanation on their website says - "Check back weekdays to see the editor's selections. From the Daily Dozen, a selection of photos will be published monthly in National Geographic magazine." I am sure there are tons of photographs that are submitted everyday under the 'your shot' category and the great editorial team goes through the photographs and have a dozen photographs finalized for each week of the month. 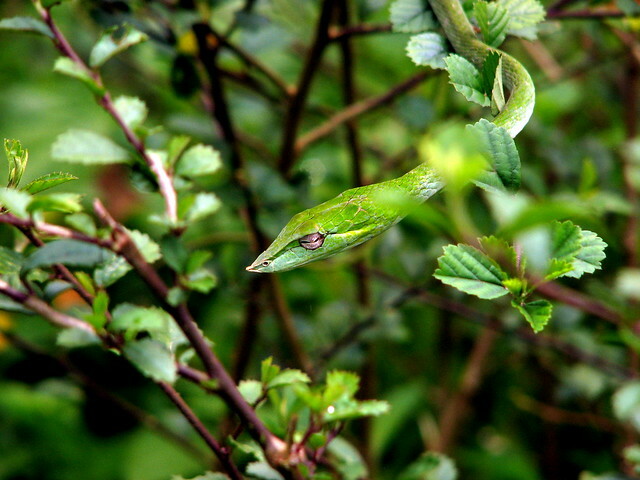 I am really glad they selected a photograph of mine shot in August 2010 in Agumbe, very close to the Agumbe Rainforest Research Station (ARRS), it is a Green Vine Snake - Oxybelis fulgidus. So as I share the photograph I thought I must share a few facts collected from several sources on the web and offline. 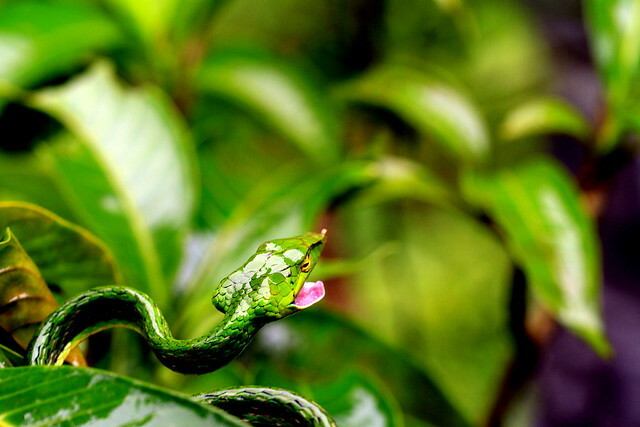 > A vine snake is a reptile it is about 1.5-2 meters. 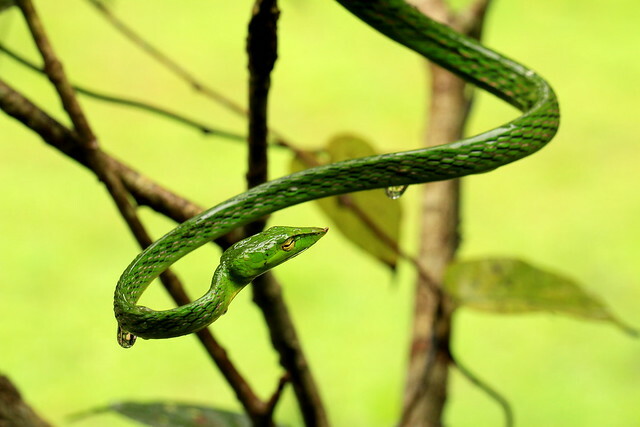 > A vine snake is a remarkably slender snake. It is almost the skinniest snake in the world. 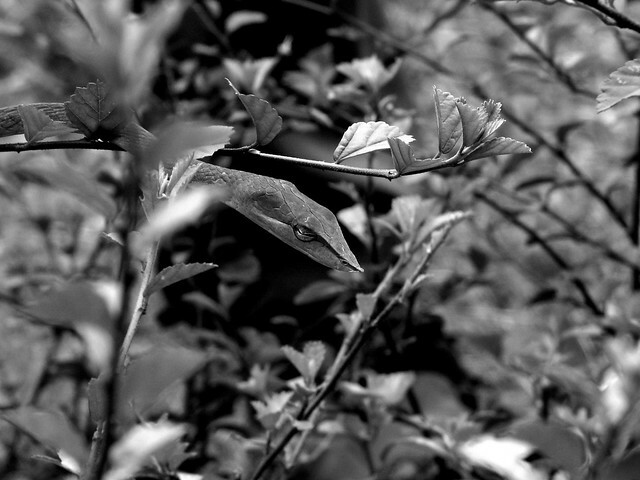 > They lie amid the branches of forest trees, and are almost indistinguishable from the abundant creepers and vines. > They have sharp rear fangs with mild venom. They are slow moving predators, but in the morning they are very active they snack mainly lizards (sometimes baby 'tiny' birds which are alone in the nest). > Only two species of green snake exist, known commonly as the rough and the smooth green snake. 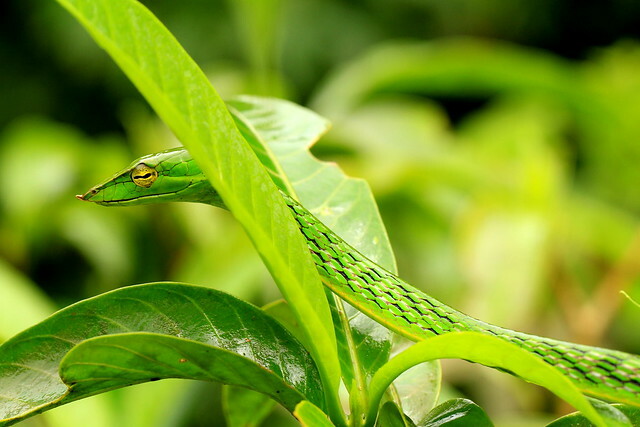 Five subspecies of green snakes exist, and all are distinguishable by their characteristic bright green color that allows them to easily blend into grass and other vegetation, protecting them from predators and even human detection. > They track prey using their tongues to detect scents of prey and can even capture prey flying through the air. 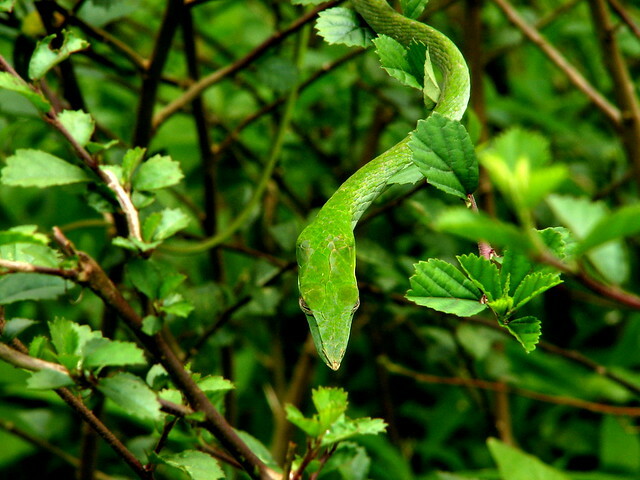 Green snakes of both species hunt during daylight hours and rest at night. > A vine snake can extend half of its body into midair when crossing a branch. > Snake’s scales are made up of something called Keratin, which is the same thing that our fingernails are made from. > Vine snakes are remarkable because they appear to have binocular vision. 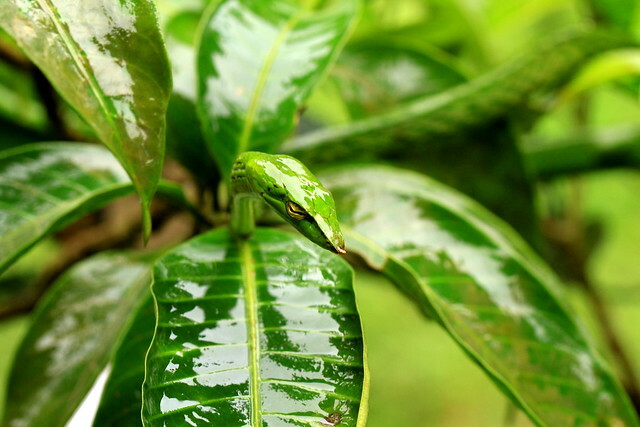 >The green vine snake stays high on trees and looks down to the ground. When a mouse, lizard or nest is found the snake follows the prey a short distance and smells it carefully. If the snake is content with it, it bites into the head and lifts the prey 20–40 cm from the ground. With this the snakes prevents the prey from using its physical strength. > The vine snake has two larger teeth at the back of its mouth; these teeth permit the toxic saliva to penetrate the wounds and to immobilize the prey. Then it is rapidly swallowed. Once the prey is completely in the snakes body, the vine snake searches for a resting place, usually in the highest point of a tree. > They usually concentrate on a slow moving prey and concentrate on it for as much as 10 - 20 minutes and keep coming lower to the ground towards its prey and suddenly strikes and gets its prey. 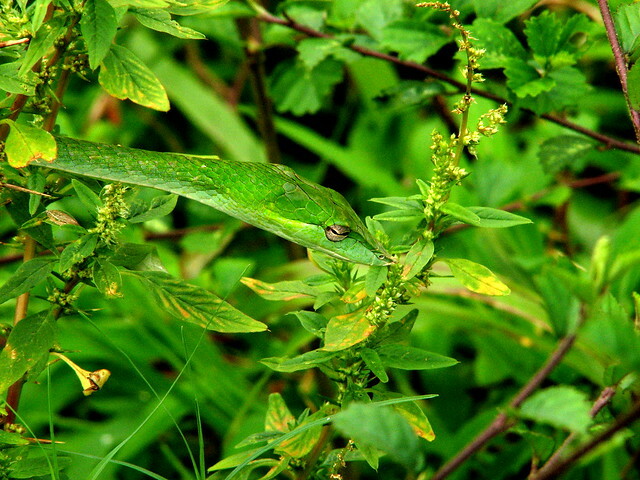 Myth: Vine Snakes are commonly found. It is greatly feared and almost always killed when seen. In many areas, it is unwisely believed that Vine Snakes will nip at a person’s eyes and peck them out. Pls ensure you don't agitate a snake to get photographs, don't crowd over, make sudden movements in front of them. This was a natural shot and the snake was not troubled or forced to hiss!! !